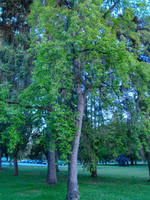 Littleleaf Linden is a large, deciduous shade tree. Its unique, heart-shaped leaves have fine teeth on the margins and are much smaller than those of the Big Leaf Linden. Its small, fragrant yellow-green flowers are said to have medicinal properties and can also be used to make honey. Littleleaf Linden is a great choice for a boulevard or large lot. Black Cherry is common in eastern North America but a rare find elsewhere. This tree is shade tolerant and is often found in old fields, forest openings, and along fencerows. The fruit is used to flavor rum and brandy. It is also edible and often eaten raw or used in wine or jelly. Black Cherry wood is a rich reddish-brown color and is strong, making it valued in cabinetry and woodworking. It is often used in reclamation as well. The leaves can poison livestock as they contain cyanide derivatives and precursors. However, many have noted that deer still seem to browse their trees with impunity and birds and other animals eat the fruit when available.